Brew a variety of one-touch beverages at home with the PicoBaristo. Additional Specialities: Hot water and frothed milk. 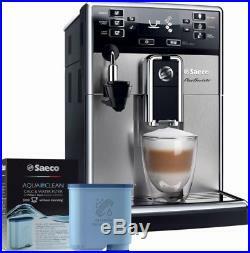 Saeco PicoBaristo with Automatic Milk Frother. The largest variety from a compact machine. 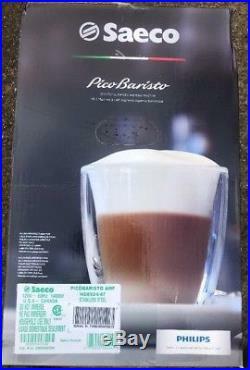 PicoBaristo is a premium compact machine which spoils coffee lovers with quality and variety. Via the user interface you can choose from a wide choice of specialties at one touch. And now with the AquaClean filter you can enjoy up to 5,000 cups of coffee without descaling. 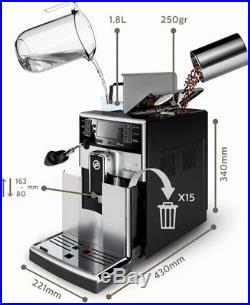 By replacing the filter when prompted, you can enjoy up to 5,000 cups of coffee without having to descale your machine. 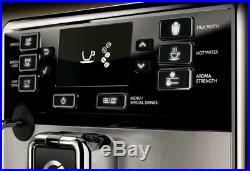 With the beautiful backlit display, you can easily enjoy a multitude of specialty coffees at the touch of a button. Advanced technology designed for coffee perfection. Velvety froth at one touch with the Automatic Milk Frother. You can add the frothed milk to the one-touch coffees for even more variety. Long Lasting Ceramic grinders for the perfect taste. The robust 100% ceramic grinders creates the ideal grind. Unlike other grinders, the ceramic material prevents the coffee from over-heating and tasting burnt. 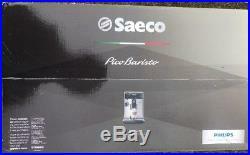 Removable brewing group - A Saeco Innovation. The removable brew group ensures that the machine makes everything on its own, so that you can have your fresh beans ground consistently each time at the touch of a button. Quick Heat Boiler no waiting! Our heating boiler technology is super-fast, allowing immediate brewing of each cup of coffee beverage one after the other. Customize your coffee to your preference. Choose your ideal strength from the 5 different settings, select the length and the temperature. You can easily save your desired coffee length with the Memo Function for each drink. 10-settings adjustable grinder for intensity control. Different coffee blends require different levels of granularity for the full flavour to unfold. So the grind granularity of this machine has ten adjustable settings from the finest grind for a full-bodied espresso, to the coarsest for a lighter coffee. 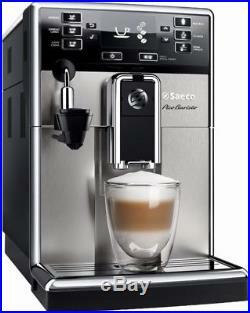 Craft delicious hot beverages at home with this Saeco PicoBaristo espresso machine. The ceramic grinders have 10 settings to ensure the right consistency for an optimal brew, and the automatic frother lets you add frothed milk for specialty coffee drinks. 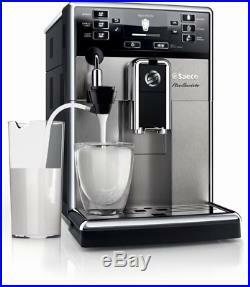 This compact Saeco PicoBaristo espresso machine fits easily onto your kitchen counter. The espresso machine's ceramic grinders deliver premium espresso coffee from fresh beans for 20,000 cups guaranteed. Enjoy 7 beverages at your fingertips, from espresso to cappuccinos and lattes;Boiler Design :Thermoblock. 5,000 cups of coffee without descaling your espresso maker thanks to the AquaClean water filter. Velvety froth at one touch with the automatic milk frother. Large capacities in compact design: 8.8oz Bean Container, 15x Waste Container; 60.9oz. 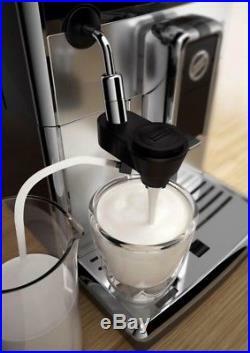 Prepare tasty cafe creme, cappuccino, ristretto, espresso, lungo, milk foam and double espresso, just the way you like. Automatically grinds the beans before brewing. 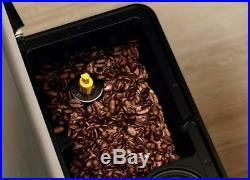 The integrated grinder lets you turn your favorite whole beans into grounds for fresh results. 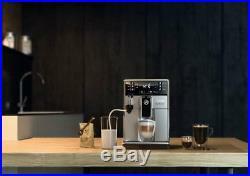 Allows you to set your coffee size to your own personal preferences. A removable drip tray detaches easily from the machine and features a dishwasher-safe design to simplify cleaning. Water hardness test strip; measuring spoon; cleaning brush; lubrication tube; AquaClean filter cartridge. 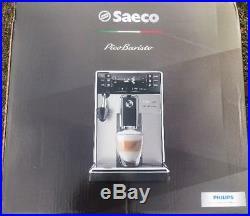 Saeco HD8924/47 PicoBaristo AMF Super Automatic Espresso Coffee Machine" is in sale since Wednesday, November 21, 2018. This item is in the category "Home & Garden\Kitchen, Dining & Bar\Small Kitchen Appliances\Coffee, Tea & Espresso Makers\Espresso & Cappuccino Machines". The seller is "tastethedeal" and is located in Clifton, New Jersey. This item can be shipped to United States, Canada, United Kingdom, Denmark, Romania, Slovakia, Bulgaria, Czech republic, Finland, Hungary, Latvia, Lithuania, Malta, Estonia, Australia, Greece, Portugal, Cyprus, Slovenia, Japan, China, Sweden, South Korea, Indonesia, Taiwan, South africa, Thailand, Belgium, France, Hong Kong, Ireland, Netherlands, Poland, Spain, Italy, Germany, Austria, Bahamas, Israel, Mexico, New Zealand, Singapore, Switzerland, Norway, Saudi arabia, Ukraine, United arab emirates, Qatar, Kuwait, Bahrain, Croatia, Brazil, Chile, Colombia, Costa rica, Panama, Trinidad and tobago, Guatemala, Honduras, Jamaica, Viet nam.